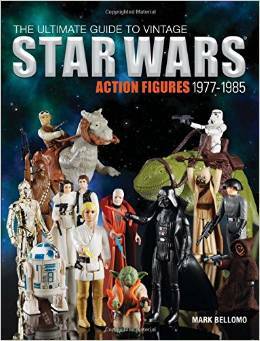 Mark Bellomo’s new book, The Ultimate Guide to Vintage Star Wars Action Figures 1977-1985 is an excellent resource for the fan who loves the classic Star Wars action figure line. Featuring the figures, vehicles, creatures, and playsets, the book takes you on a nostalgic trip down memory lane, as the reader encounters visual feasts, as well as gets to enjoy an encyclopedic reference guide to the history of the figures. Whether you grew up with these toys, are experiencing them for the first time on the secondary market, or are simply curios about the evolution of Star Wars toys, this is the resource for you. It will quickly become an important piece of your Star Wars collection. Bellomo has written a number of books covering the classic G.I. Joe, Transformers, and Superheroes, and he takes his considerable talents to Star Wars with great effect. The book goes through the Kenner collection in sequential order, and each entry contains a multitude of information to not only whet your appetite, but to help you truly experience this incredible line of toys. Bellomo gives a thorough explanation at the beginning of the book on how to use the book, and gives a brief history of the line. You learn as you are entertained, and feel very much like you are going through a virtual museum of all the things you loved as a child. The price descriptions are particularly illuminating; while some collectors are aware of how the secondary market works, some are still learning about all the intricacies of action figure collecting, and Bellomo’s intro walks you through the different price descriptions, and what they mean. There are price points to consider for each item, with the caveat that the market is constantly in motion, and will continually ebb and flow, based on what is going on in the Star Wars universe. Mark makes no secret that the prices were researched when the book was written, and may have altered, depending when you are experiencing the pages within. Regardless, it is fascinating, and helps demonstrate which items are in demand, as well as which may be easier to obtain, based on financial constraints. Perhaps the biggest surprise is the amount of history provided for each character. Each entry is exacting in what is known of the characters, based on an impressive assortment of references provided at the back of the book. The information was added before the shift to the Lucasfilm Story Group happened, but that does not mean you will be lacking in information. Based on the films, as well as the current Legends storylines (previously, the Expanded Universe), there is much to learn and enjoy, and it is wonderful. Not only do you get to enjoy the photos, but you experience so much more about each collectible. The photos are from Bellomo’s personal collection, and all of them are presented out of their respective packaging. The figures are shown in various poses, with different weapons and accessories shown where applicable. Variants are provided as well, and, yet again, help to exact a complete experience of every item in Kenner’s line. The Ultimate Guide to Vintage Star Wars Action Figures 1977-1985 is an engrossing book, as you will flip through it multiple times, appreciating something new with every turn of the page. The renaissance Star Wars fans and collectors are experiencing ever since the announcement of a new era in the saga is palpable, and The Ultimate Guide to Vintage Star Wars Action Figures 1977-1985 is an invaluable guide to this incredible line of Star Wars collectibles that helped to shaped so many childhoods for fans. Each turn of the page will have you reliving wonderful memories, as well as learning more about each toy. Full of nostalgia, beautiful images, engaging prose, and cultural significance, The Ultimate Guide to Vintage Star Wars Action Figures 1977-1985 is another must have for fans of Star Wars action figures. Mark Bellomo an excellent guide, full of passion, talent, and knowledge, and you will undoubtedly return to these pages time and time again, reliving those amazing memories of a galaxy far, far away, eternally played out in the minds and hearts of your inner child. Note: A big thanks to Krause Publications for providing an advanced copy to review. Great review. This book has just gone on my wish list as a result of your review. I don’t think it will be long before I order this one.